Anyways, Kurt is a host on arguably the best fitness podcast in the country, Barbell Shrugged. I am not really into following strict nutrition advice or regimented programming, because, honestly, I am just too lazy and undisciplined. But, I like the guys on the show, because I think that they are real people, who truly give a sh*t about their message and the well-being of others. I came across this post on Kurt’s wall earlier this week, and I have found myself re-visiting it numerous times. I love the message. I love the reality of it, and I love the perspective. This is from a guy who knows, first hand, what it is like to achieve a different look or different level of strength, only to find that people don’t love your look or your strength. 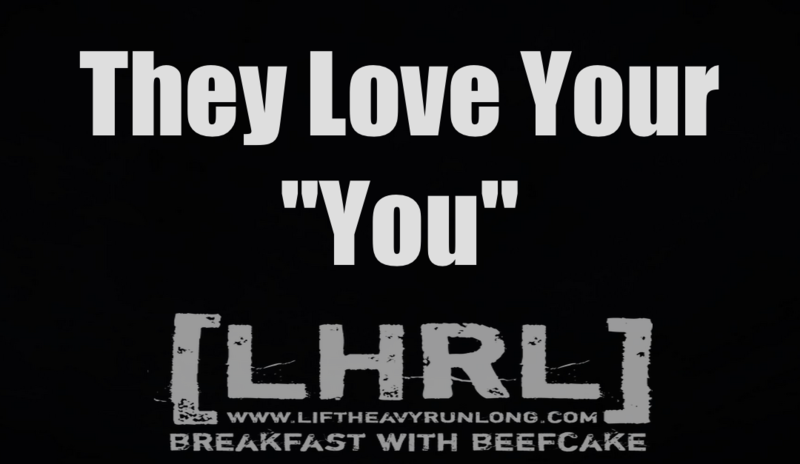 They love your “you”. Get a read. It’s worth it. Kurt, sorry for stealing your stuff. It needs to be seen. People deserve this sort of truth. “It just now dawned on me that people will buy a supplement because someone bigger, faster, leaner or stronger than themselves might take that supplement. After that container is empty, and when you aren’t like the athlete or entertainer seen in the ad, you will keep on buying it and other things in an endless cycle that leaves you feeling much like the last container (and possibly your wallet). Empty. Or maybe you made it!! Maybe now you’re huge and shredded or strong after a year or two. Then you look around and see that all the attention you got came and went, and after the storm settled, the only ones left standing by you already loved you in the first place, but you can’t see it because you’re looking for the likes and the cheers. There’s that empty feeling again. Learn to do things through self love. Be nice to yourself. Eat things you believe your body would appreciate, and supplement the same way. Don’t do it because someone else does it or to look a certain way so you can appeal to others. Do it for you, and keep on, even when it’s hard -and you’ll find that it becomes habit, like anything. You’ll find good choices are easy to make when you’re being nice to yourself, and the results you wanted all along will come in time, and during that time you will be at peace. My name is Wilson Horrell, aka “Beefcake”. I am a total fat guy. At heart, I am a drunken, cigarette-loving, junkie, and addict of all things unhealthy. I reached rock-bottom back in the Summer of 2011 and decided to get clean. With sobriety came a great deal of changes in my day-to-day life. I am a big, lazy animal who somehow got mixed up in CrossFit, started hanging with the crowd at LHRL, and watched my life and daily habits change. I started blogging as a way to journal my fitness, and it has turned out to be very therapeutic. I have found that my life is enhanced by community, and I am at my happiest when I am interacting with other people. I have a beautiful and incredibly intelligent wife, Amanda, as well as two wonderfully gifted children, Grayson and Andie Kate. I have no education or experience as a writer, and almost no knowledge of grammar. I just enjoy spitting it out on paper as it goes through my brain. I hope you enjoy reading, and feel free to reach out or comment at anytime!